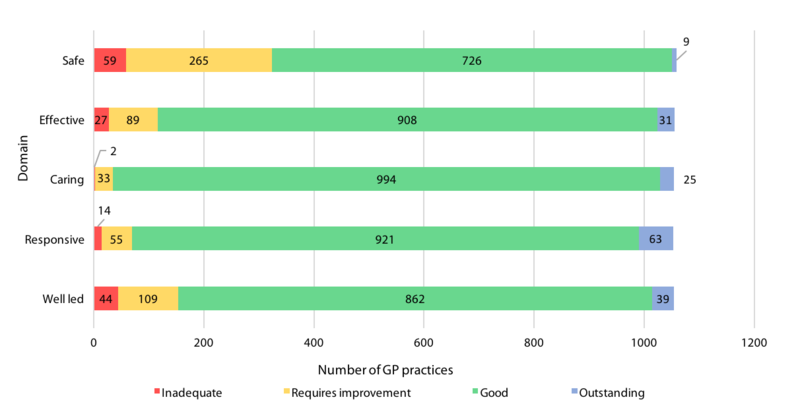 The CQC inspections: what does ‘Outstanding’ general practice look like? themes and examples of 'Outstanding' practice. The Care Quality Commission (CQC) has been inspecting and rating all general practices, including out-of-hours services in England, since 1 October 2014. The purpose of our inspections is to ensure that people receive safe, effective, and high-quality care from providers.1 We also encourage providers to improve, and have a commitment to search for 'Good' and 'Outstanding' practice and celebrate it when we find it. By publishing our reports and highlighting these examples of excellence on our website, we aim to promote the spread of best practice across the country. is it responsive to people's needs? Our appendices to the GP ProviderHandbook4 details the characteristics of each rating and describes what 'Outstanding' practice looks like for each of the key questions above (see Box 1, below). People are protected by a strong comprehensive safety system, and a focus on openness, transparency, and learning when things go wrong. Outcomes for people who use services are consistently better than expected when compared with other similar services. People are truly respected and valued as individuals and are empowered as partners in their care. Services are tailored to meet the needs of individual people and are delivered in a way to ensure flexibility, choice, and continuity of care. The leadership, governance, and culture are used to drive and improve the delivery of high-quality person-centred care. The distribution of ratings accross each of these domains is shown in Figure 1 (below). Of note, the safety domain had the fewest 'Outstanding' ratings and, correspondingly, the highest number of 'Inadequate' ratings. The highest prevalence of 'Outstanding' practice was in the responsive domain, which reflects the fact that practices often try innovative and effective ways to improve access and additional services for particular patient groups. What makes a practice 'Outstanding? demonstrate that they are playing an active role in ongoing initiatives in their local area. What are the themes of 'Outstanding' practice? The most common theme of excellent and safe practice relates to significant event analysis (SEA). Practices rated 'Outstanding' discussed and shared their learning from SEAs with the multidisciplinary team and other external bodies, for example the Clinical Commissioning Group (CCG), local GP practices, and other external bodies. This demonstrates a commitment to patient safety and improvement across the whole local health economy (see Case study 1, Box 2, below). Significant events were used as a real opportunity for learning. Records demonstrated how the practice team learnt from incidents and subsequently improved safety standards. The practice had a rigorous, standardised approach to investigating safety incidents by clearly defining the issue, identifying appropriate actions, and implementing improvements. As a result of one incident, the practice worked proactively with colleagues in the wider health community to bring about collective action to improve patient safety both in the practice and across the local area. Excellent clinical service was a theme among several 'Outstanding' practices in the effective domain. These practices offered new services for patients, which they could demonstrate had improved the experience or outcomes for patients (see Case study 2, Box 3, below). We also saw several 'Outstanding' examples of practices working effectively with external organisations. In these examples, practices had worked hard over many years to build and maintain strong working relationships with organisations such as schools, universities, local fire services, and benefits advisory services. The practices then used these relationships to deliver innovative or enhanced services that benefited patients (see Case study 3, Box 3, below). The Advanced Nurse Practitioner ran an Xpert Diabetes Programme (XDP)—a structured, 6-week long, group-based education programme for patients with diabetes. This programme was unique in the local area and was supported by the GP partners who recognised the importance of patient empowerment. Each 2.5 hour session aimed to improve patients' knowledge, skills, and confidence in self-managing their diabetes and had a weekly attendance of 10–18 patients. The practice was also able to demonstrate improved outcomes for patients in their national data, such as weight loss and reduction in both HbA 1c and cholesterol levels. Feedback about the programme from attendees was overwhelmingly positive. The practice worked effectively with other community agencies for the benefit of patients. For example, the practice issued 'social prescriptions' for advice from benefits advisers and debt counsellors, in order to address financial anxieties. These counselling sessions identified people who were not receiving their full benefit entitlements, and support was then given to the patient to rectify this. Practices that were 'Outstanding' in the caring domain typically went the extra mile to support patients with their emotional needs. Others were simply extremely kind and compassionate in their approach to patients and demonstrated this in numerous small, but exceptional ways (see Case study 4, Box 4, below). This is the most challenging domain for us to rate as 'Outstanding', and the examples often need little further explanation. The practice created a charity to support homeless people. The foundation had recently funded a day-trip to the beach for a terminally-ill homeless person before they died. The practice also contributed to the funeral costs and memorials following the death of other patients who were homeless. In addition, the practice supported patients in maintaining a memory wall at a nearby wet day centre for street drinkers. The responsive domain is the place where most of the 'Outstanding' ratings were given. As a result, there is a broad range of themes from the examples we have seen. Improving access to services is a common theme. These examples range from flexible approaches that guarantee sameday appointments and extended practice opening hours, to highly responsive language support for non-English speaking patients at every interaction with the practice—from reception desk to consultation room. These are rated 'Outstanding' because the practices have taken time to consider the needs of their populations, and have implemented changes to improve the experience for people using their services (see Case studies 5 and 6, Box 5, below). Some practices demonstrated their responsiveness to certain population groups, such as young people, patients with complex medical problems, and homeless people. These examples highlighted how innovative solutions were used to address the needs of a specific group. These solutions were characterised by creativity (e.g. using a text message service for young patients with diabetes as described in Case study 7, Box 5, below) and flexibility (such as the approach for homeless people described in Case study 8, Box 5, below). The practice had initiated a new appointment system so that all patients who required an appointment with a GP were seen on the day their request was made. Requests could be made at any time of the day, and the practice had late-night and weekend appointments for working-age patients. This system was working particularly well for older people and the practice had noted that these patients were contacting the practice at an earlier stage in their illness. The practice had worked in collaboration with other neighbouring practices to secure funding to support the needs of non-English speaking people in the area, comprising 9% of the total population. Multilingual support workers were available at the practice and to visit newly registered patients at home. All non-English-speaking patients were routinely given 20-minute appointments. The practice offered mobile phone access for teenagers with insulindependent diabetes. These patients were able to text the Nurse Practitioner with their blood test results or if they had any concerns about managing their diabetes, and would receive a response with the appropriate advice. The practice provided services to patients on the special allocation scheme: a scheme for patients who had been removed from other practices' lists due to challenging behaviour. This service was provided three mornings per week and appointments were for 30 minutes. The practice also worked with the local Salvation Army to provide medical care and health advice to homeless patients. The practice's Health Care Assistant visited the Salvation Army each week to see if any homeless patients needed medical care or health advice, and arranged for a GP visit if necessary. In addition, to improve patient access to medical correspondence, the practice sent the medical correspondence to the Salvation Army if the patient requested this. Examples of 'Outstanding' leadership are also challenging to articulate, since it is often the 'Outstanding' leadership that drives the more tangible examples of excellent practice in the other domains. The common themes in this domain relate to the culture that the practice leaders create, which manifests in excellent staff development and support. When practices are well led, their patients are often placed right at the centre of what the practice does. As a result, these practices often have 'Outstanding' patient participation groups that are involved in multiple aspects of the practice's business, including influencing practice development and coordinating services (see Case Study 9, Box 6, below). It has been shown that healthcare organisations demonstrating strong performance place high importance on staff development.7 Many of the 'Outstanding' practices we inspected demonstrated their effective leadership by implementing special programmes to aid staff development or to support staff in their role (see Case Studies 10 and 11, Box 6, below). The practice had an active patient participation group, carer support group, and 'Friends of the practice' group. These volunteer groups, co-ordinated by a member of staff, improved services for patients and influenced changes at the practice. The groups offered services to patients or carers—especially those who were lonely or isolated; for example, the carer support and 'Friends of the practice' groups offered lunch clubs for housebound patients, a telephone support service, a sitting and befriending service, weekly social events, and support for carers. The 'Friends of the practice' group was also involved in raising funds for gas and air equipment and patient transport. The practice had a scheme to provide mentoring for GPs on their return from long-term leave of absence. This included a named GP mentor, mentor reviews and consultations around any issues or concerns, regular meetings to discuss progress, and additional administrative breaks in the returning GP's schedule. The programme was not time-limited and was developed and implemented around the needs of the GP, who returned to full duties when they felt ready. The practice operated an apprentice scheme that started in 2008. This involved a 2-year apprenticeship to gain a level two non-vocational qualification (NVQ) in business administration. The scheme has led to 100% employment for apprentices following completion of the apprenticeship in either the same practice or other local practices. One of the apprentices had also been offered further development opportunities and now has a supervisory role in the practice. There are numerous examples of 'Outstanding' general practice across England, and the CQC will continue to celebrate them and encourage all providers to improve. We plan to have inspected all general practices in England by September 2016, which will give us a more complete picture of the quality of primary care across the country. We will be publishing further examples of 'Outstanding' care on our website (see www.cqc.org.uk/outstandingprimarycare) throughout the year. Boxes 2–6 (see above) provide case studies that highlight examples of 'Outstanding' care. Care Quality Commission. Who we are.www.cqc.org.uk/content/who-we-are (accessed 6 August 2015). Blake A, Sparrow N, Field S. The CQC inspections: what they mean for general practice. Br J of Gen Pract 2015; 65 (632): 112–113. Care Quality Commission. The five key questions we ask. www.cqc.org.uk/content/fivekey-questions-we-ask (accessed 6 August 2015). Care Quality Commission. Examples of outstanding practice for GPs. www.cqc.org.uk/ content/examples-outstanding-practice-gps (accessed 6 August 2015). Care Quality Commission. Results from our latest checks on all services. Available at: www.cqc.org.uk/search/services/ all?page=2&f=im_field_popular_ services%3A3671&f=im_field_inspection_ rating%3A3925 (accessed 6 August 2015). Mannion R, Davies H, Marshall M. Cultural characteristics of 'high' and 'low' performing hospitals. J Health Organ Manag 2005; 19 (6): 431–439.